My encaustic and fiber sculptures reduce larger images and concepts into elegant simplified forms. I pare down basic elements of color, shape and movement in order to acknowledge another kind of space. I often struggle with the title each work, wanting it to enlarge the meaning of each piece to the viewer. I enjoy working with familiar materials including wax, cheesecloth, wire, twine, found metal and paper, altering them into something different and unexpected. While I create in both two and three-dimensions, I am particularly interested in offering experiences beyond the traditional or predictable and enjoy the interaction that occurs when viewers encounter my sculptures. The exploration of materials and techniques has been a driving interest throughout my art career. Though I began as a traditional artist engaged in applying paint to the flat surfaces, I soon developed a unique process of weaving my own deconstructed paintings into textural/dimensional constructions. Since discovering encaustic, I have used its translucent and adhesive qualities to layer paper lines and other shapes and materials to achieve a sense of depth and motion. My process rarely involves a preconceived message or concept. I start with a point or line, a piece of paper, or a divot in the wax. That then informs my selection and manipulation of the next element. Piece by piece and layer by layer, an idea - a memory of sights and sounds or a feeling - develops in my mind, and a visual representation of it results. My thoughts and my process may be influenced by the materials themselves - their color, shape, and size; and my placement and manipulation of materials is reciprocally influenced be the developing concept. Street photography by artist Jim Redd of 1980s Wicker Park, Chicago. Last 2018 show of the year! Join us with the artist for the opening reception and vintage from Estate Chicago and Tangerine Vintage. Drinks, appetizers and lots of holiday cheer as we celebrate all of the artists who exhibited this year! to the chaos in our world today. egalitarian society of these small and industrious insects. propels division, where external and internal walls become more important than building bridges, empathy, and community. City on the Move showcases Chicago street photography from three women photographers seen from three different perspectives. Julie Dworkin noticed in the summer of 2017 that someone had been hanging swings from trees in Logan Square much to the delight of Logan Square residents. One of the swings hung from a tree at the Centennial Monument at the very heart of the neighborhood. Julie was on a sabbatical from her job for the month of September and planned to do a lot of shooting outdoors while the weather was nice. In walking past the Monument she noticed that there was always someone on the swing. And it wasn’t just children as one might have expected. Many adults passing through (as well as those who hung out at the Monument during the day) could not resist the allure of the swing. So she visited the swing every day for 14 days and photographed anyone who got on the swing, ultimately shooting 57 different people. Julie has lived in Logan Square for twenty-one years and has seen the neighborhood change and become more white and middle class. But the Monument seems to be one part of the neighborhood that has resisted the pull of gentrification. It is a space that is still used by long-time residents, teenagers on skateboards, young families, and homeless people. The photographs show what the face of Logan Square looks like in 2017 through the lens of the swing. She talked to each person as they swung to learn about their connection to Logan Square. Most lived in the neighborhood. Some were life-long residents. The one thing they all shared was the joy and nostalgia of being on a swing. 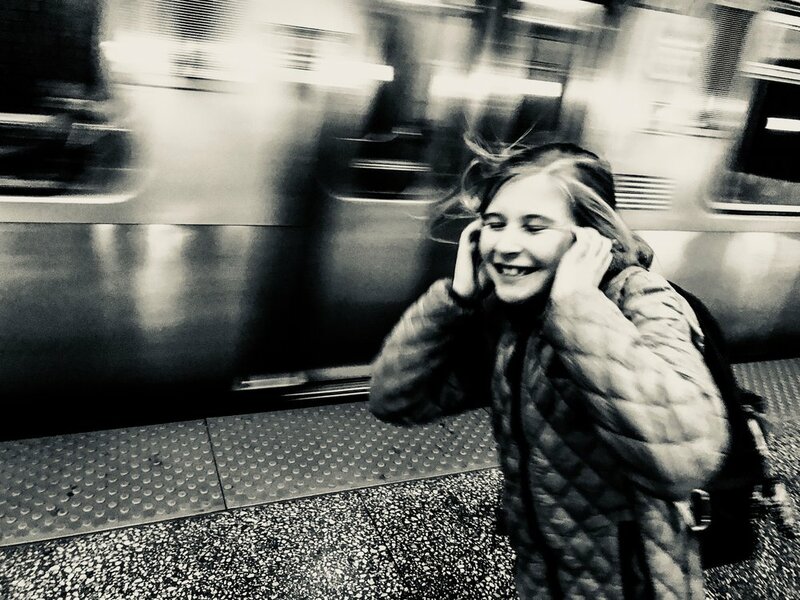 Deborah McCoy snaps photos of people riding transit on her commute to and from work showing little moments of city life. Wendy Love approaches street photography in the same way she reads books: as a ticket to experience the world from someone else’s perspective. And, just as any reader’s personal history filters the story, Wendy’s project meshes her own point of view with the scenes she observes as she explores neighborhoods beyond her own. Making photography a priority after a long career as a journalist, communicator, marketer and researcher, Wendy dedicated time every week for the past three years to walking and looking, sometimes talking, and photographing neighborhoods around our city. The photos in her series share one important thing she learned: Truth cannot be faked. It’s there in the way we live, and the impressions we make. Julie Dworkin is a photographer and mother of two children, ages ten and twelve. For paid work, she advocates for public policy changes to address homelessness. Starting in 1995, Julie shot outdoor black and white photography, infrared black and white, and slides for Polaroid transfers. She belonged to a cooperative gallery in Oak Park called the Art House where she had a number of exhibits including one featuring the Chicago river as seen from land and from a boat. She also did a solo show in a cafe in Logan Square after a trip to Southeast Asia. 2014, she bought a digital camera and took the plunge into digital photography. Julie’s work has focused on architectural details and street scenes and more recently on portraits. In 2015, she did a solo show at Voice of the City in Logan Square of photographs focused on reflections and light and shadow. The photographs were displayed using fabric and plumb lines that hung throughout the space. The show was very successful and the opening was able to raise additional funds to help offset costs that Voice of the City invested in the exhibit. Julie has lived in Logan Square since 1996 and have been very active in the neighborhood with Logan Square Neighborhood Association fighting for affordable housing, at her children’s school, Goethe Elementary, and on various political campaigns. She feels strongly about her ties to the community and would love to show her work in the neighborhood. Deborah McCoy grew up in Hoffman Estates, a bedroom suburb of Chicago, in the fifties with parents who were active in their Episcopal church, their community and local politics. She was her dad's darkroom helper as he processed his black and white photos for peewee football teams, youth dance groups and political candidates. She was always happy to carry his camera bag and assist in any way during photo assignments. Deborah has lived in Logan Square Chicago since 1981 and came to digital photography in 2007 to support her own interest in community organizing and particularly non profit groups addressing issues of equity in Chicago communities of color. She is a past president of Logan Square Neighborhood Association and a past State Chair of Independent Voters of Illinois - Independent Precinct Organization. Her particular focus is affordable housing, community schools and voter access. Photography is work and therapy. It is a skill that can be shared. It is also an escape when life is challenging. Recently she has been exploring the neighborhood areas of Chicago by public transit. Wendy Love is a professional photographer and the founder of Pivot Photography. Her expertise includes journalistic assignments, event photography, sports action and natural light portraits. Wendy’s personal work is inspired by her love for Chicago and the Midwest, and a passion for telling true stories. She is a member of Women in Focus Chicago, an artist-initiated organization of female photographers, and her photos have been featured online, in print, and in several group exhibitions over the past three years, most recently as part of the “In the ‘Hood” exhibit at Jackson Junge Gallery in Wicker Park.. This body of new work by Pauline Kochanski is a series of new works on paper with graphite, pen and ink reflecting on the natural world. Featuring 14 pieces as well as sculpture and installation. The opening ceremony is dedicated to her late husband, Frank Crowley. Nothing is more beautiful and interesting than the adaption of nature to its environment. Drawings of nature opens my artistic creations to new possibilities and furthers the complexity of my work. For years I have focused my aesthetic expression on photography. With the advent of digital photography and understanding the harmful effects of photographic chemicals on the environment I turned my artistic expression to my first love...drawing. Working in graphite, color pencil, ink and watercolor expands my artistic discoveries and leads me to to new aesthetic ideas. Solo exhibition with art and vintage interiors by artist Kelly Caldwell, a lover of minimalism. The event will feature contemporary art designed by Caldwell himself paired with Midcentury Modern furniture, lighting and smalls. Kelly Caldwell is known for his administration work on the Facebook page: Mid Century Modern Chicago and was the host of the Logan Square event at Ugo’s: Vintage Cares: A Benefit for Puerto Rico that was held right down the street on Armitage this past Fall. Best friends and artists, Liz Laughlin and Scott Pearson present new work that showcases their shared aesthetics of magical realism. Working in different mediums Liz and Scott, both, create figurative work that often displays an odd and fanciful notion of reality. This new work finds the artists working in a unique collaboration; each appropriating from the other quirks, techniques, and objects to imbue their own works with the sensibilities of the other. This "borrowing" from each other creates a symbiosis between the works that mirror the relationship between the two artists. The simplicity of the paintings of Liz Laughlin belies their impact. At first glance, the stylized figures that inhabit her paintings feel primitive or naive. As you continue to look, you feel the impact of the expression and emotion she is able to transmit in her "simple" figures. The shape of an eye or the misshape of a mouth, intentionally skewed by the artist, inexplicably creates familiar and knowing portraits. Scott Pearson works within and outside the world of the "picture plane." His paintings and constructions, often the results of shamanic dreams, are filled with metaphors and symbols that recreate memories, realities, and experiences. Broad strokes, layered scribbling, an irreverence to both the picture plane and combination of objects, work in tandem simultaneously to produce his canvases and assemblages. 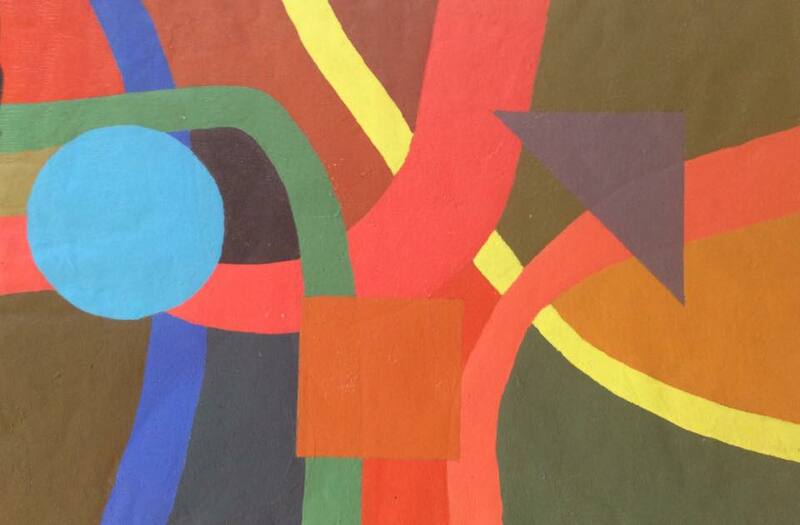 Mitch Clark, professor emeritus at Blackburn College, will be showing his latest series of paintings at RECESS; a solo exhibition with 8 abstract pastels and 4 paintings with a bold use of color and fun whimsical shapes, like children at play. The opening reception is Friday March 2nd from 5-10 PM and additional gallery hours available by appointment. This is a solo exhibition with photography by Chicago artist Michael Thompson. Opening reception Dec 1st 5-10 PM. Closing January, 1, 2018. This is a group show of 3 international female artists: Sharon Gilmore, Beatriz Ledesma and Mirtes Zwierzynski on immigration and the concept of home and displacement. Opening reception Friday October 6th from 5-10pm. Saturday retail hours 11-4. This show is the culmination of a month long residency at Textílsetur Íslands in Blönduós, Iceland. The felt sense of Iceland is one of palpable resilience in a forbidding yet rich landscape. I explored the "felt sense" of the landscape through wet felting with Icelandic wool. Eugene Gendlin gave the name "felt sense" to the unclear, pre-verbal sense of "something" as it is experienced in the body. He was working with psychotherapy. In my work with wool I often float in this place. I currently work with raw fiber (wool, alpaca, silk) making works of felt working mostly using wet felting technique. I am exploring wearable as well as sculptural art: Nuno-felted scarves and dresses (using silk & cotton textiles and fiber); vessels; wrapped found objects, stones, and driftwood; and larger pieces including rugs, wall art, sculpture, and game boards; bags; and hats. Much of my work is created over days or even weeks. I strive at all times to be conscious ofthe craft at play, my experience of the materials, and the awareness of the evolution of the felt work. My inspiration is gathered from the world I experience, from nature, and from other artists’ work all of which inform my work in color and composition. After exploring many media I feel like I have come home when I work with felt. Fiber and felting feel like a perfect expression of what I want to create: objects of beauty which are satisfyingly tactile and which nourish the soul. Oliva Gallery will be attending Color Me Outsider 22nd Annual Outsider Art Fair with folk, visionary and outsider art. Featuring works by Howard Finster, Richard Palider, Larry Collins, Fredda Burton and Corinne D. Peterson. Preview party $25.00 September 1st Friday from 6-9pm benifitting the Michiana Humane Society. Hours Saturday 11am-6pm and Sunday from 11am-5pm. Opening Reception: Meet the artists on Friday, July 21st, 2017. 5PM-10PM. Gallery Hours: Saturday, July 22nd, 11AM-4PM and by appointment through Sept 2, 2017. My formal training as an artist began with my receiving a BFA in painting from Eastern Michigan University in Ypsilanti, Michigan. It concluded with the attainment of a MFA in painting from Western Michigan University. While at school at Eastern Michigan University I had several shows at the university and other local venues. Also while at Western Michigan University I had several shows at the university and other local venues. Since moving up to Bay City, I had a show during the Art Walk Series. I also had my paintings at A & J Gallery in Bay City, Michigan and a show entitled Youthful Playthings at the Creative Spirit Center (now called 360 degrees) in Midland, Michigan... The A & J Gallery is closed now. I have my artwork shown at C.A.T. Works Art Gallery in Bay City, Michigan and now here at the Art for Saginaw Gallery. I also had a part in a group show in Saginaw in 2011 and part of a group show in 2016 at the Greater Flint Arts Center. Since getting my first book published I have had 30 book published through the imprint createspace . My most prized book is “ Jumbled: an artist’s view of Parkinson’s”. I was diagnosed in 2010. Before this diagnosis I couldn't even draw with my right hand ( I am righthanded). Now I can draw with both hands . In a way having Parkinson's has improved my artwork . It has become “ richer”. A long-time antiques dealer and collector of outsider art, Chris Heck travels the Midwest and the South in search of unique objects, sculptures, and paintings. HIs collections, along with his formal studies in anthropology, have informed his own artistic practice. He handcrafts live edge wood tables with metal inlays that are both sleek and modern yet raw at the same time. Heck is not limited to one medium as he also produces large-scale, abstract drip paintings that call to mind primordial organisms and the Italian practice of book marbling. Opening Reception: Friday, March 31st, 2017. 5PM-10PM. For me, artmaking is a force for developing connections between the past and present, between opposing forces of nature, between the intellect and subconscious and between me and my artistic materials. I have stripped away much of the overt symbolism of my earlier art to work mainly with the forms of architecture and nature. In my newest work, I use openings to explore elusive inner life, its shifts and mysteries, as it relates to outer life. Working with nature and clay connects me to my early roots of growing up on a Minnesota farm. Cracks, fissures, scars and pools of glaze are all part of my personal artistic vocabulary. The colors I use come primarily from rocks, leaves, and other bits of nature I’ve collected and studied since childhood. I use layers and layers of color and fill the cracks with dark tones for a sense of history. I intend for each work to expose the evidence of its own past, much as a person reveals an accumulation of his or her experiences. Corinne D. Peterson grew up on a farm near Anoka, Minnesota, and attended North Park University in Chicago. She earned a M.A. in Social Work from the University of Illinois at Chicago in 1980, and then developed a psychotherapy practice. While preparing to study Jungian analysis, her dreams about clay led her to take a clay class at Lillstreet Art Center. Captivated by the possibilities of artistic expression with clay, Peterson took more classes, developed her skills, and shifted her career focus to art. She was awarded several residencies at the Ragdale Foundation and was in residence at Tegelgården, Sweden and Taiwan Normal University. Her studio is at Lillstreet, where she produces her sculpture, works with interns and teaches classes. Peterson also has presented her work in many panels, lectures, seminars and workshops. Peterson’s sculptures are in numerous private and public collections, including Kirkland & Ellis, Advocate Lutheran General Hospital, Deloitte, Burrell Communications and Oakton College. Her clay tile murals and mosaics can be seen at many Chicago area locations, including the CTA station at Roosevelt and State, Latin Middle School, Portage Park Senior Center and other Chicago Park District facilities. Peterson has exhibited throughout the country and in solo shows at The Cliff Dwellers in Chicago; Noyes Cultural Art Center and Dittmar Gallery at Northwestern University, Evanston; University of Notre Dame in Indiana and National Taiwan Normal University in Taipei. Recent group exhibits include CSI at Art Chicago and Bridgeport Art Center, Antonovych, Niespodziewana, Peterson at Ukrainian Institute of Modern Art and outdoor installations at Krasl Biennial Sculpture Invitational 2008-09, Chattanooga River Walk 2009-10 and Form in Flora at Garfield Park Conservatory 2010. This will be a group show with Deva Suckerman from Art by Deva which will feature original artwork on reclaimed wood. Also there will be ladies accessories from Deva Suckerman & Tangerine Vintage, Rockin' Robin & Estate Chicago. Opening reception from 5 to 9pm on June 24th and open studio from 11am to 4pm to June 25th. Richard Palider outsider art from Chris Heck of Midwest Mantiques and original artwork from Larry Collins will be featured in this group exhibition. Opening reception is Friday April 29th from 6 to 9pm. On Friday March 11th, Oliva Gallery will open its inaugural exhibition featuring art by Chicago artist Jonathon Ernst with a reception from 5pm to 9pm. Additional exhibition hours on Saturday March 12th and Sunday March 13th will be 11am to 7pm.